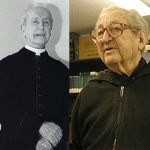 Recently, Brother André Marie was invited to give this talk at a Catholic parish in Mapleville, Rhode Island, at the invitation of the pastor, Father Roman Manchester. 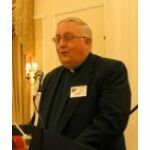 He and two other Rhode Island priests, one of whom also attended Brother’s talk, were attendees at our October, 2013, conference. There were about one hundred people present; these included students from Father Manchester’s Adult Catechism class and young confirmandi. Brother’s subject was our doctrinal crusade as it stands in opposition to the current liberal view of salvation irregardless of religious belief. This remarkably lucid and erudite one-hour presentation covered the history of the Church’s infallible de fide teaching on the necessity of being incorporated into the Catholic Church by baptism and remaining therein by faith, and living therein by sanctifying grace through the sacraments. 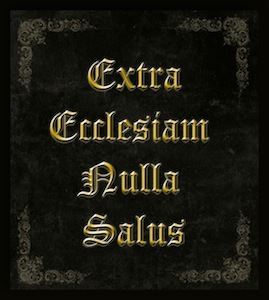 Brother divided his talk into three parts: doctrine (and the legitimate vs illegitimate development of dogma), the irreformability of ex cathedra teaching, and the modern assaults on the literal meaning of extra Ecclesiam nulla salus by subtle loopholes, dissolvent speculations, and direct contradictions. This is the best one-hour summation in defense of the doctrinal crusade of Saint Benedict Center that we have ever produced audibly. It provides an excellent, easily understood, overview of Father Feeney’s and Brother Francis’ life-long teaching in defense of the salvation dogma, with answers to the more common theories put forth against the dogma’s clear sense. Excellent for acquainting interested people with the irreformable dogma as it was upheld throughout the early Church and all the Christian centuries with the exception, obvious to unbiased minds, of our own. The hour-long Question and Answer part of Brother Andre’s presentation was equally informative and lively, respectful for the most part, but, at times, at least with one questioner who was bent on pulpiteering, combative. Almost all the “questions” were actually questions, giving Brother a chance to elucidate points that were only briefly touched upon or not brought up at all during his talk. The first questioner raised the issue of “invincible ignorance.” The second asked about the Orthodox. This question gave Brother an opportunity to distinguish between those simple folk who attend an Orthodox Church, receive valid sacraments, and have no problem in their heart with the supremacy/infallibility of the Bishop of Rome, and those who literally hate all that is “Roman” in the universal Roman Catholic Church. The third question regarded the hoped-for unity between Catholic and Orthodox. 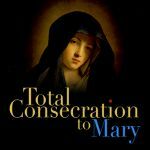 This question allowed Brother to address the promise of Our Lady of Fatima and, after the proper consecration of Russia to her Immaculate Heart, of the conversion of that entire nation and its Church, the largest by far of all the Orthodox schismatic Churches. Another attendee asked about private revelations and their status in terms of a hierarchy of papal approval and our obligation of assent. 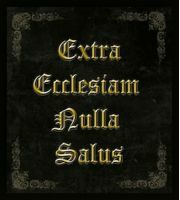 The most controversial questions or “dictations” then followed in tandem with each dealing with the authority of Vatican II. Brother explained in more detail what he had introduced at the start of his talk concerning the three levels of magisterial teaching. This discussion went back and forth for some time and Brother’s erudition shone forth brilliantly. For those who listened with docility it was an illuminating education. The next-to-the-last question was offered by a very respectful young man who wanted advice on how to convert Protestant friends and/or family members. Finally, a man asked whether the Mystical Body of Christ has greater extension than the Roman Catholic Church and whether “subsistence” was the same as essence, as in Vatican II’s new formula that the Mystical Body “subsists in” the Catholic Church, rather than the traditional equation that the Mystical Body “is” the Catholic Church.